The new Honda HR-V seems to have it all, from advanced safety for new drivers, sporty performance for seasoned drivers, and a versatile interior for families. 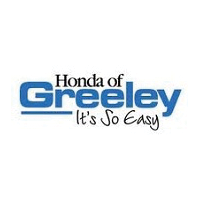 Available now at Honda of Greeley, enjoy some of its biggest perks! Let us make the shopping and financing experience much easier than you could have ever imagined! Call us to schedule a test drive of your favorite trim at 970-363-8044! Delivers 31 Highway MPG and 27 City MPG! This Honda HR-V delivers a Regular Unleaded I-4 1.8 L/110 engine powering this Variable transmission. Wheels: 17 Silver-Painted Alloy, VSA Electronic Stability Control (ESC), Urethane Gear Shift Knob. *This Honda HR-V Comes Equipped with These Options *Trip Computer, Transmission: Continuously Variable w/Sport Mode, Torsion Beam Rear Suspension w/Coil Springs, Tires: 215/55R17 94V AS, Tailgate/Rear Door Lock Included w/Power Door Locks, Strut Front Suspension w/Coil Springs, Steel Spare Wheel, Sliding Front Center Armrest, Single Stainless Steel Exhaust, Side Impact Beams. Boasts 31 Highway MPG and 27 City MPG! This Honda HR-V delivers a Regular Unleaded I-4 1.8 L/110 engine powering this Variable transmission. Wheels: 17 Silver-Painted Alloy, VSA Electronic Stability Control (ESC), Urethane Gear Shift Knob. * This Honda HR-V Features the Following Options *Trip Computer, Transmission: Continuously Variable w/Sport Mode, Torsion Beam Rear Suspension w/Coil Springs, Tires: 215/55R17 94V AS, Tailgate/Rear Door Lock Included w/Power Door Locks, Strut Front Suspension w/Coil Springs, Steel Spare Wheel, Sliding Front Center Armrest, Single Stainless Steel Exhaust, Side Impact Beams. Scores 31 Highway MPG and 27 City MPG! This Honda HR-V delivers a Regular Unleaded I-4 1.8 L/110 engine powering this Variable transmission. Wheels: 17 Silver-Painted Alloy, VSA Electronic Stability Control (ESC), Urethane Gear Shift Knob. * This Honda HR-V Features the Following Options *Trip Computer, Transmission: Continuously Variable w/Sport Mode, Torsion Beam Rear Suspension w/Coil Springs, Tires: 215/55R17 94V AS, Tailgate/Rear Door Lock Included w/Power Door Locks, Strut Front Suspension w/Coil Springs, Steel Spare Wheel, Sliding Front Center Armrest, Single Stainless Steel Exhaust, Side Impact Beams. Scores 31 Highway MPG and 27 City MPG! This Honda HR-V delivers a Regular Unleaded I-4 1.8 L/110 engine powering this Variable transmission. Wheels: 17 Silver-Painted Alloy, VSA Electronic Stability Control (ESC), Urethane Gear Shift Knob. *This Honda HR-V Comes Equipped with These Options *Trip Computer, Transmission: Continuously Variable w/Sport Mode, Torsion Beam Rear Suspension w/Coil Springs, Tires: 215/55R17 94V AS, Tailgate/Rear Door Lock Included w/Power Door Locks, Strut Front Suspension w/Coil Springs, Steel Spare Wheel, Sliding Front Center Armrest, Single Stainless Steel Exhaust, Side Impact Beams. Boasts 31 Highway MPG and 26 City MPG! This Honda HR-V delivers a Regular Unleaded I-4 1.8 L/110 engine powering this Variable transmission. Wheels: 18 Machine-Finished Alloy -inc: matte black inserts, VSA Electronic Stability Control (ESC), Urethane Gear Shift Knob. *This Honda HR-V Comes Equipped with These Options *Trip Computer, Transmission: Continuously Variable w/Sport Mode -inc: dual-mode paddle shifters, Torsion Beam Rear Suspension w/Coil Springs, Tires: 225/50R18 95V AS, Tailgate/Rear Door Lock Included w/Power Door Locks, Strut Front Suspension w/Coil Springs, Steel Spare Wheel, Sliding Front Center Armrest, Single Stainless Steel Exhaust w/Chrome Tailpipe Finisher, Side Impact Beams. Delivers 31 Highway MPG and 26 City MPG! This Honda HR-V delivers a Regular Unleaded I-4 1.8 L/110 engine powering this Variable transmission. Wheels: 18 Machine-Finished Alloy -inc: matte black inserts, VSA Electronic Stability Control (ESC), Urethane Gear Shift Knob. * This Honda HR-V Features the Following Options *Trip Computer, Transmission: Continuously Variable w/Sport Mode -inc: dual-mode paddle shifters, Torsion Beam Rear Suspension w/Coil Springs, Tires: 225/50R18 95V AS, Tailgate/Rear Door Lock Included w/Power Door Locks, Strut Front Suspension w/Coil Springs, Steel Spare Wheel, Sliding Front Center Armrest, Single Stainless Steel Exhaust w/Chrome Tailpipe Finisher, Side Impact Beams. Boasts 31 Highway MPG and 26 City MPG! This Honda HR-V boasts a Regular Unleaded I-4 1.8 L/110 engine powering this Variable transmission. Wheels: 18 Machine-Finished Alloy -inc: matte black inserts, VSA Electronic Stability Control (ESC), Urethane Gear Shift Knob. *This Honda HR-V Comes Equipped with These Options *Trip Computer, Transmission: Continuously Variable w/Sport Mode -inc: dual-mode paddle shifters, Torsion Beam Rear Suspension w/Coil Springs, Tires: 225/50R18 95V AS, Tailgate/Rear Door Lock Included w/Power Door Locks, Strut Front Suspension w/Coil Springs, Steel Spare Wheel, Sliding Front Center Armrest, Single Stainless Steel Exhaust w/Chrome Tailpipe Finisher, Side Impact Beams. Scores 31 Highway MPG and 26 City MPG! This Honda HR-V boasts a Regular Unleaded I-4 1.8 L/110 engine powering this Variable transmission. Wheels: 18 Machine-Finished Alloy -inc: matte black inserts, VSA Electronic Stability Control (ESC), Urethane Gear Shift Knob. *This Honda HR-V Comes Equipped with These Options *Trip Computer, Transmission: Continuously Variable w/Sport Mode -inc: dual-mode paddle shifters, Torsion Beam Rear Suspension w/Coil Springs, Tires: 225/50R18 95V AS, Tailgate/Rear Door Lock Included w/Power Door Locks, Strut Front Suspension w/Coil Springs, Steel Spare Wheel, Sliding Front Center Armrest, Single Stainless Steel Exhaust w/Chrome Tailpipe Finisher, Side Impact Beams. Scores 31 Highway MPG and 26 City MPG! This Honda HR-V delivers a Regular Unleaded I-4 1.8 L/110 engine powering this Variable transmission. Wheels: 18 Machine-Finished Alloy -inc: matte black inserts, VSA Electronic Stability Control (ESC), Urethane Gear Shift Knob. * This Honda HR-V Features the Following Options *Trip Computer, Transmission: Continuously Variable w/Sport Mode -inc: dual-mode paddle shifters, Torsion Beam Rear Suspension w/Coil Springs, Tires: 225/50R18 95V AS, Tailgate/Rear Door Lock Included w/Power Door Locks, Strut Front Suspension w/Coil Springs, Steel Spare Wheel, Sliding Front Center Armrest, Single Stainless Steel Exhaust w/Chrome Tailpipe Finisher, Side Impact Beams. Scores 31 Highway MPG and 26 City MPG! This Honda HR-V delivers a Regular Unleaded I-4 1.8 L/110 engine powering this Variable transmission. Wheels: 17 Unique Silver-Painted Alloy, VSA Electronic Stability Control (ESC), Variable Intermittent Wipers. * This Honda HR-V Features the Following Options *Urethane Gear Shift Knob, Trip Computer, Transmission: Continuously Variable w/Sport Mode -inc: dual-mode paddle shifters, Torsion Beam Rear Suspension w/Coil Springs, Tires: 215/55R17 94V AS, Tailgate/Rear Door Lock Included w/Power Door Locks, Strut Front Suspension w/Coil Springs, Steel Spare Wheel, Sliding Front Center Armrest, SiriusXM Radio -inc: SiriusXM services require a subscription after any trial period, If you decide to continue your SiriusXM service at the end of your trial subscription, the plan you choose will automatically renew and bill at then-current rates until you call SiriusXM at 1-866-635-2349 to cancel, See our Customer Agreement for complete terms at www.siriusxm.com, Fees and programming subject to change, XM satellite service is available only to those at least 18 years and older in the 48 contiguous United States and D.C, SiriusXM Radio Inc, Sirius, XM and all related marks and logos are trademarks of SiriusXM Radio Inc. Boasts 31 Highway MPG and 26 City MPG! This Honda HR-V boasts a Regular Unleaded I-4 1.8 L/110 engine powering this Variable transmission. LUNAR SILVER METALLIC, GRAY, CLOTH SEAT TRIM, Wheels: 17 Unique Silver-Painted Alloy. *This Honda HR-V Comes Equipped with These Options *VSA Electronic Stability Control (ESC), Variable Intermittent Wipers, Urethane Gear Shift Knob, Trip Computer, Transmission: Continuously Variable w/Sport Mode -inc: dual-mode paddle shifters, Torsion Beam Rear Suspension w/Coil Springs, Tires: 215/55R17 94V AS, Tailgate/Rear Door Lock Included w/Power Door Locks, Strut Front Suspension w/Coil Springs, Steel Spare Wheel. Delivers 31 Highway MPG and 26 City MPG! This Honda HR-V boasts a Regular Unleaded I-4 1.8 L/110 engine powering this Variable transmission. MODERN STEEL METALLIC, GRAY, CLOTH SEAT TRIM, Wheels: 17 Unique Silver-Painted Alloy. *This Honda HR-V Comes Equipped with These Options *VSA Electronic Stability Control (ESC), Variable Intermittent Wipers, Urethane Gear Shift Knob, Trip Computer, Transmission: Continuously Variable w/Sport Mode -inc: dual-mode paddle shifters, Torsion Beam Rear Suspension w/Coil Springs, Tires: 215/55R17 94V AS, Tailgate/Rear Door Lock Included w/Power Door Locks, Strut Front Suspension w/Coil Springs, Steel Spare Wheel. Scores 31 Highway MPG and 26 City MPG! This Honda HR-V delivers a Regular Unleaded I-4 1.8 L/110 engine powering this Variable transmission. Wheels: 17 Unique Silver-Painted Alloy, VSA Electronic Stability Control (ESC), Variable Intermittent Wipers. *This Honda HR-V Comes Equipped with These Options *Urethane Gear Shift Knob, Trip Computer, Transmission: Continuously Variable w/Sport Mode -inc: dual-mode paddle shifters, Torsion Beam Rear Suspension w/Coil Springs, Tires: 215/55R17 94V AS, Tailgate/Rear Door Lock Included w/Power Door Locks, Strut Front Suspension w/Coil Springs, Steel Spare Wheel, Sliding Front Center Armrest, SiriusXM Radio -inc: SiriusXM services require a subscription after any trial period, If you decide to continue your SiriusXM service at the end of your trial subscription, the plan you choose will automatically renew and bill at then-current rates until you call SiriusXM at 1-866-635-2349 to cancel, See our Customer Agreement for complete terms at www.siriusxm.com, Fees and programming subject to change, XM satellite service is available only to those at least 18 years and older in the 48 contiguous United States and D.C, SiriusXM Radio Inc, Sirius, XM and all related marks and logos are trademarks of SiriusXM Radio Inc. Delivers 31 Highway MPG and 26 City MPG! This Honda HR-V delivers a Regular Unleaded I-4 1.8 L/110 engine powering this Variable transmission. Wheels: 17 Unique Silver-Painted Alloy, VSA Electronic Stability Control (ESC), Variable Intermittent Wipers. *This Honda HR-V Comes Equipped with These Options *Urethane Gear Shift Knob, Trip Computer, Transmission: Continuously Variable w/Sport Mode -inc: dual-mode paddle shifters, Torsion Beam Rear Suspension w/Coil Springs, Tires: 215/55R17 94V AS, Tailgate/Rear Door Lock Included w/Power Door Locks, Strut Front Suspension w/Coil Springs, Steel Spare Wheel, Sliding Front Center Armrest, SiriusXM Radio -inc: SiriusXM services require a subscription after any trial period, If you decide to continue your SiriusXM service at the end of your trial subscription, the plan you choose will automatically renew and bill at then-current rates until you call SiriusXM at 1-866-635-2349 to cancel, See our Customer Agreement for complete terms at www.siriusxm.com, Fees and programming subject to change, XM satellite service is available only to those at least 18 years and older in the 48 contiguous United States and D.C, SiriusXM Radio Inc, Sirius, XM and all related marks and logos are trademarks of SiriusXM Radio Inc.
Scores 31 Highway MPG and 26 City MPG! This Honda HR-V delivers a Regular Unleaded I-4 1.8 L/110 engine powering this Variable transmission. LUNAR SILVER METALLIC, GRAY, LEATHER-TRIMMED SEAT TRIM, Wheels: 17 Unique Silver-Painted Alloy. *This Honda HR-V Comes Equipped with These Options *VSA Electronic Stability Control (ESC), Variable Intermittent Wipers, Trip Computer, Transmission: Continuously Variable w/Sport Mode -inc: dual-mode paddle shifters, Torsion Beam Rear Suspension w/Coil Springs, Tires: 215/55R17 94V AS, Tailgate/Rear Door Lock Included w/Power Door Locks, Strut Front Suspension w/Coil Springs, Steel Spare Wheel, Sliding Front Center Armrest and Rear Center Armrest. Boasts 31 Highway MPG and 26 City MPG! This Honda HR-V delivers a Regular Unleaded I-4 engine powering this Variable transmission. CRYSTAL BLACK PEARL, BLACK, LEATHER-TRIMMED SEAT TRIM, Wheels: 17 Unique Silver-Painted Alloy. *This Honda HR-V Comes Equipped with These Options *VSA Electronic Stability Control (ESC), Variable Intermittent Wipers, Trip Computer, Transmission: Continuously Variable w/Sport Mode -inc: dual-mode paddle shifters, Torsion Beam Rear Suspension w/Coil Springs, Tires: 215/55R17 94V AS, Tailgate/Rear Door Lock Included w/Power Door Locks, Strut Front Suspension w/Coil Springs, Steel Spare Wheel, Sliding Front Center Armrest and Rear Center Armrest. Boasts 31 Highway MPG and 26 City MPG! This Honda HR-V delivers a Regular Unleaded I-4 1.8 L/110 engine powering this Variable transmission. PLATINUM WHITE PEARL, GRAY, LEATHER-TRIMMED SEAT TRIM, Wheels: 17 Unique Silver-Painted Alloy. *This Honda HR-V Comes Equipped with These Options *VSA Electronic Stability Control (ESC), Variable Intermittent Wipers, Trip Computer, Transmission: Continuously Variable w/Sport Mode -inc: dual-mode paddle shifters, Torsion Beam Rear Suspension w/Coil Springs, Tires: 215/55R17 94V AS, Tailgate/Rear Door Lock Included w/Power Door Locks, Strut Front Suspension w/Coil Springs, Steel Spare Wheel, Sliding Front Center Armrest and Rear Center Armrest.